For better or worse, Fable is one of the staple series for Xbox consoles. Since its beginning as a relatively simple action-RPG, it has seen some entries go off in various directions. 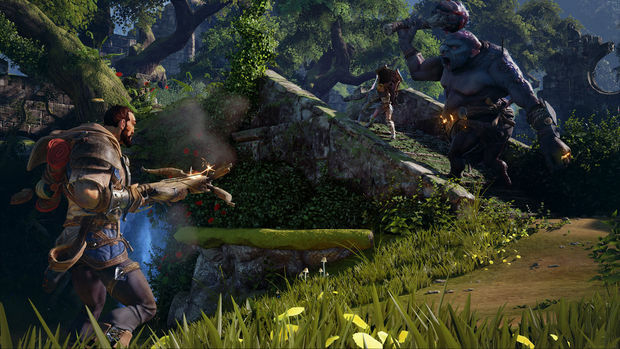 Fable Legends is another game that takes the core gameplay and spins it off into something unique for the franchise. 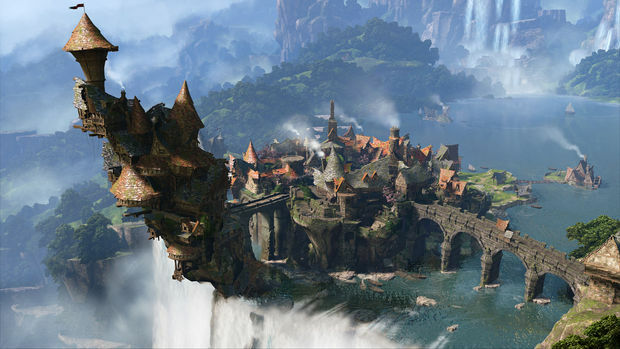 Rather than focusing on a single player adventure with highly customizable character progression, heroes in Fable Legends are one of four set characters, and the four venture together to take on more action-oriented challenges. It might be a far cry from main series Fable, but it works well. On display was the adversarial multiplayer mode, in which four players control the heroes and one player controls the villain. Playing as a hero is most familiar to Fable fans; each hero has a normal attack, as well as a handful of special abilities. Inga is the tank of the group, lugging around an enormous shield. With her special abilities, she can pull enemies close to her, taunt them so they attack her instead of her allies, and put up a shield wall to block ranged attacks. Sterling is more of a glass cannon, with the ability to quickly slice and stab monsters, but limited defense. With his special abilities, he can slap monsters to stun them, close a lot of distance quickly, or attack at range with throwing daggers. Rook is the ranged attacker, equipped with a crossbow. With his special abilities, he can punch enemies who get too close, fire explosive bolts from his bow, or save himself from being knocked out. Winter acts as a support spellcaster, with freezing magic to slow monsters. With her special abilities, she can summon a large area-of-effect storm attack, shatter frozen enemies, or protect allies by covering them with a coat of ice. I played as Sterling, and his abilities have their own unique economy to them. By landing normal melee attacks or thrown dagger hits, he builds up Sterling Tokens. 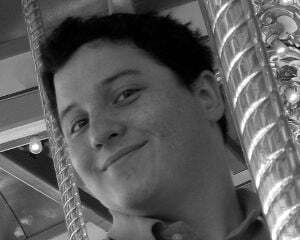 Sterling can then perform a heavy attack that gets stronger the more tokens he has. His special abilities are also tied to Sterling Tokens, which keeps him from being able to spam them. As with Left 4 Dead, the heroes must stick together and cooperate in order to stand a chance. If heroes are separated, their outlines are visible through walls in order to facilitate regrouping Downed heroes can be revived, but the process takes long enough that it only works if the villain has no monsters or traps nearby or if he is not paying attention. What separates Fable Legends from more standard cooperative games is that another player can take on the role of the villain. In contrast to the heroes, the villain player gets a bird's-eye view of the battlefield. He has at his disposal several groups of monsters and a few traps to spring. Before an encounter, he chooses placement for his units, so they will not necessarily show up in the same spots from game to game. For the villain player, it looks more like a real-time strategy game than a role-playing game. From the zoomed out perspective, he commands units and sets off traps. Among his traps are explosive mines, smoke bombs, and spike walls. The spike walls are particularly interesting, because they can be used to separate heroes who venture too far ahead or fall too far behind the group, letting monsters gang up. At the demonstration, most groups of heroes were getting beaten pretty badly. After fighting through waves of monsters, an ogre appeared as the boss for the encounter. Though our group had done fairly well up until that point, we were ambushed from behind by a group of goblins, and were all quickly knocked out. Balance can be tough in asymmetric multiplayer games, and it is not clear if the consistent hero failure was a matter of balance or if it was simply a lack of teamwork as we worked through the mission. 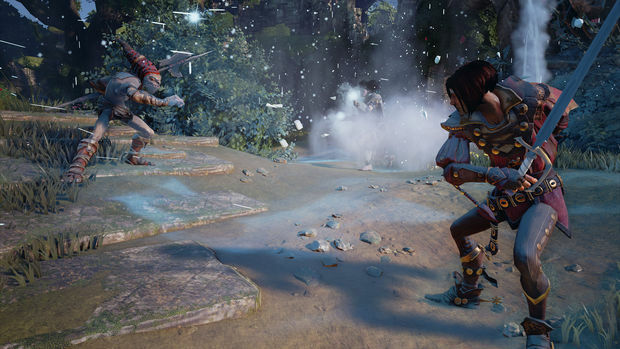 If it ends up feeling fair for either side, Fable Legends looks like it could provide some interesting multiplayer gaming.